I am so terribly sorry to share the news that First Hampshire District’s State Representative Peter Kocot died yesterday after an illness. The article in today’s Daily Hampshire Gazette captures the statewide sentiment about this man of tremendous conviction, intelligence and passion to serve. Representative Kocot’s commitment to social and economic justice also specifically included his commitment to end homelessness. He was an incredible champion of the Western Massachusetts Network to End Homelessness as the lead sponsor of the Network’s earmark. And that leadership and support extended to the broad array of regional and statewide efforts to prevent and end homelessness across the Commonwealth. Governor Baker has ordered all flags to be flown at half-staff until the day of interment in honor of Representative Peter Kocot. This entry was posted in News on February 23, 2018 by Pamela Schwartz. Rebecca Muller, a Network Leadership Council member, asked to post this article from Nautilus Magazine, Why Poverty is Like a Disease.” Food for thought and discussion as we go forth in this work. This entry was posted in News on May 1, 2017 by Pamela Schwartz. The Friends of the Homeless recently announced its merger with Clinical & Support Options (CSO). You can read more about it here. This entry was posted in News on August 2, 2016 by Pamela Schwartz. Soldier On, Inc. has exciting news regarding our Chapin School project. The Commonwealth of MA had committed rental subsidies for all 43 units ! If you know of a veteran in need of affordable housing, we strongly encourage you to have them complete the attached application. The Chapin School Veterans project, located at 40 Meadow St, Chicopee, will provide safe, affordable housing for 43 Veterans. The units are all one-bedroom units. 3 units are accessible and 1 unit is adapted for persons who require sensory accommodations. Anticipated occupancy is June 1, 2016. As the first round of residents will be selected by a lottery, we must have completed applications returned to Soldier On, Inc. by April 25th 2016. Please feel free to copy and distribute to any potential applicants. Additional information regarding the project can be obtained by calling me at 413-387-3639. And from Gerry McCafferty: Please note that these units are available to all veterans, regardless of eligibility for Veterans Health Services. This entry was posted in News, Veterans on April 25, 2016 by Gerry McCafferty. BOSTON – The Executive Office of Health and Human Services (EOHHS) announced today it awarded $865,000 in funding to create eight regional consortiums to provide crisis interventions services to families and individuals facing acute housing instability across the Commonwealth. An additional $1 million will be allocated to develop and implement specialized services for youth under the age of 24 who are homeless or at risk of homelessness. Under this grant, the eight chosen lead organizations are tasked with creating and assembling the regional Consortiums, which will develop a coordinated entry system, provide flexible funding for prevention and diversion services, and ensure the Commonwealth’s vulnerable homeless populations have timely and appropriate access to intervention within their local communities. Each regional consortium is required to have representation from housing organizations, service agencies, and other entities providing support to recent and chronic homeless individuals, with a special emphasis on homeless youth. In December 2015, the EOHHS issued a Request for Responses (RFR) soliciting proposals from community-based organizations to establish local Consortiums. EOHHS has awarded contracts to eight organizations that collectively provide statewide coverage, representing urban, rural and suburban communities. In addition, each response included a request for funding to address the unique needs of you experiencing or at risk of experiencing homelessness in their region. This entry was posted in Network, News on April 15, 2016 by Gerry McCafferty. MHSA honors Jerry Ray…Make plans to attend! 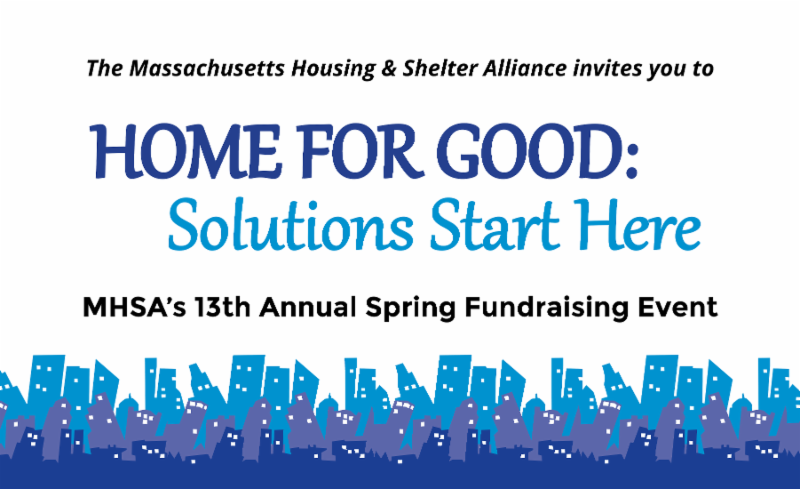 The Massachusetts Housing & Shelter Alliance (MHSA) invites you to our 13th Annual Spring Fundraising Event, Home for Good: Solutions Start Here. Thursday, May 12, 2016, 6:00 p.m. to 9:00 p.m.
Join us as we celebrate our honorees’ outstanding contributions to ending homelessness! Jerry Ray of Mental Health Association, Inc.
Show your support for our honorees’ efforts to end homelessness by purchasing your ticket or becoming a sponsor today! For more information about sponsorship levels, click here. Funds raised through Home for Good: Solutions Start Here help revolutionize how we address homelessness in Massachusetts. With your support, we can continue working with our partners to help those experiencing homelessness move off the streets, out of shelters and into their own homes. This event will be held in the Grand Ballroom of the Hyatt Regency Boston, located in Downtown Crossing, and will feature an awards presentation with a cocktail reception serving hearty hors d’oeuvres. This entry was posted in News on March 24, 2016 by Gerry McCafferty. Please see the press release below from the USDA announcing Massachusetts’ selection to participate in employment and training program for SNAP recipients. This additional job development resource is also great news for homelessness prevention efforts. This entry was posted in Best Practices, News, Secure Jobs News on March 8, 2016 by Pamela Schwartz.